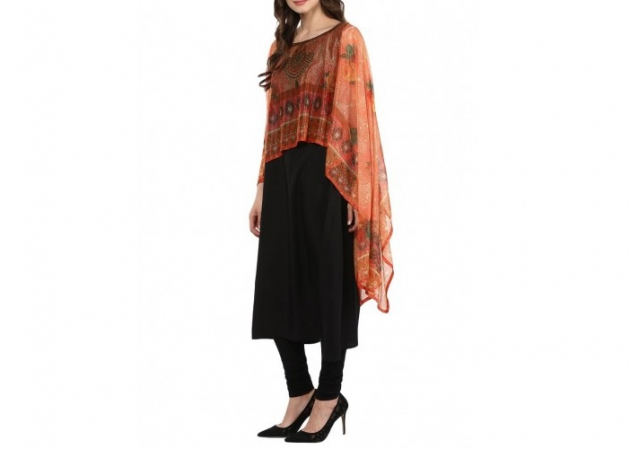 Ladies have used palazzo pants with contemporary kurtis to look great in a moment’s notice. They bring a lot of versatility, dynamism, and trendiness in paring with contemporary kurtis and with them, you are always sure of having a fresh touch with any kind of kurti you will have. You will also find it admirable that you have a whole range of options to try out pairing palazzo pants with kurtis given that they are available in a myriad of colors, designs, and styles. One of the most preferred color combinations of these pants and kurtis is deep blue and white. You can try out this combination, though you are also free to check out other solid color combinations and you can bet that the results will always be great. This combination also makes part of the old tradition that has slowly but surely made its way back to the mainstream. Jeans is a common and favorite attire amongst millions of women across the world, and so it appears as a natural choice for pairing with contemporary kurtis. Kurti with jeans will always result in great and gorgeous combination. It is undeniable that you will get good results when you correctly match kurtis with leggings, but leggings are a recent phenomenon and now might as well be the right time to check out this combination if you have never tried it in the past. The variation for pairing contemporary kurtis with jeans are endless, with variety in designs, styles, sizes, and color choices amongst others. You are virtually free to look as gorgeous as you want since you have the power at your fingertips to get the most out of pairing contemporary kurtis with jeans. You can check out Stylecaret for various options of magnificent pairs of contemporary kurtis with jeans. If you are tired of pants, palazzos, and harems as your best bottoms for kurtis, then you should try pairing your kurtis with different kinds of skirts for a change. With skirts, you have a variety of styles to try out and your only limitation will be only as far as your imagination can travel. For example, you can use the Bohemian style with contemporary kurtis to pull off the perfect cross-cultural looks. All you have to do to get it right when pairing contemporary kurtis with skirts is to consider the different styles and categories of the contemporary kurtis. For example, if you opt for kurtis that doesn’t have any flares, it will be imperative to go for traditional straight skirts for the perfect looks. If you want to have better results with these combinations, it is recommended that you pair light colored kurtis with dark colored skirts, since this will create a stylish contrast that will make you stand out with the outfit. For example, you can consider going for a red kurtis and pair it with a black skirt. Just play with the colors in that manner until you find something that works well and which you truly like. Pairing kurtis with leggings is without a doubt one of the ways that most ladies prefer currently and it is a trend that is believed to be still gathering momentum. The versatility of leggings, such as their availability in different sizes, colors, and styles ensure that almost every lady will find just the right kind of leggings they need for their kurtis. Irrespective of your size, shape or preferences, you can rest assured that you will always find the right kind of legging to pair with your kurtis. The other thing you will find admirable with pairing leggings with contemporary kurtis is that you can use the combination for both formal and informal occasions. For example, you can comfortably use formal colors such as black, white, navy blue and brown to pair with the kurtis for office wears. In addition to the formal colors, there are other casual colors you can always use when you are dressing for informal setups. Pairing contemporary kurti with Patiala salwar is an awesome combination if you are looking for a creative way to blend beauty and culture. With different types of salwar to choose from, you will have endless options when it comes to pairing the contemporary kurtis with the salwar and these feature different kinds of fabrics, color combinations, and designs. For more trendy looks, you can consider using dupatta as well, or use it if you want to have some change in the way you pair your contemporary kurtis. Cigarette pants are very hot in the market right now, and ladies have created a trend out of them by paring them with most types of kurtis, including contemporary kurtis. The right combination of these pants and kurtis have always lead to smart, classy and extremely pleasing looks. As such, this combination will not only give you very nice looks but also will put you right in the middle of a trend that is just taking off. To get better results with this combination, it is a good idea to go for light colored pants with the various tops to create the contrast necessary to make you stand out.